The NRA’s dire warnings that the president is a threat to the Second Amendment are bogus—but profitable. This article was reported in collaboration with the Nation Institute’s Investigative Fund, with support from The Puffin Foundation. The boom in the firearms industry also shows up in manufacturing statistics maintained by the Bureau of Alcohol, Tobacco, Firearms and Explosives. From 2007 to 2011, the number of firearms manufactured in the United States grew by 63 percent, led by pistols, which posted a 104 percent jump. That freshly minted arsenal translates into profits for gunmakers. Only a handful of firearms companies are publicly owned, but those that are have had good news for investors. Winchester, which makes ammunition, reported a backlog in January worth $137 million—and while 2011 wasn’t as lucrative as 2009 or ‘10, the company said it was still “the third most profitable year in at least the last two decades.” Remington sold more than 1 million guns and 2 billion rounds of ammunition in 2011. Sturm, Ruger was so overwhelmed by new business earlier this year—its gross profit jumped by 66 percent between January and June—that it imposed a brief hiatus on new orders. In short, guns aren’t like shoes that wear out every couple of years or cars that might last a decade. A gun that’s taken care of should last a lifetime. Such a durable product can be a problem for the industry that makes it. That’s why it’s crucial not only to attract new customers, but to get gun owners to buy multiple guns. And that’s where the twin fears of crime and confiscation—hyped by America’s massive gun marketing complex—come in. Tom Diaz, a researcher at the Violence Policy Center, calls it “fear marketing.” And it’s clearly effective: Remington boasts that its “brand awareness” is second only to Nike’s. But while gun-themed TV shows and magazines pump up the threat of crime, the undeniable decrease in violence nationwide naturally limits its marketing potential. Fortunately, the fear of gun regulation and confiscation is every bit as powerful and much more malleable. It can always be lurking right around the corner. Just ask the NRA. The NRA has been sounding the alarm over Barack Obama since at least 2008, when it called the then–presidential candidate a “serious threat to Second Amendment liberties” and later launched a website called GunBanObama.com. After the president was elected, the NRA’s Institute for Legislative Action warned, “American gun owners will soon be the targets of an attack dog named Rahm Emanuel.” Barely two months into the Obama administration, the NRA put out an alert called “The Coming Storm,” which described a “wish list of gun-prohibition measures” that the gun control lobby had presented to the White House. Gun sales—which fell 23 percent the first year that George W. Bush was president—soared 23 percent in 2009. Yet the “coming storm” blew past without incident, as Obama took up none of the wish list measures. Attorney General Eric Holder said in 2009 that the administration wanted a new ban on “assault weapons,” but the bid was quickly dropped. Instead, Obama signed a bill that year permitting guns to be carried in national parks. “Obama has done everything in his power to stay away from the gun issue,” Feldman says. In 2011, after Representative Gabby Giffords was shot in the head and six others killed by Jared Lee Loughner, who was wielding a Glock handgun with an extended magazine, Obama gave a nice speech but offered no policy. When the Trayvon Martin shooting in February pointed up the problems with “Stand Your Ground” laws, Obama delivered a moving statement but no substance. The “Fast and Furious” controversy gave the gun lobby what at least looked like live ammo rather than blanks. The now infamous operation was tragically mishandled and made worse by the administration, which proffered false statistical claims in its own defense. But much of the manufactured outrage on the right clearly sought to vindicate its depiction of Obama as a gun-grabber. After the probe into the scandal, the White House imposed a modest regulation requiring gun stores in the four Southern border states to report to the ATF whenever anyone purchases more than one rifle with a detachable magazine within five days. NRA allies introduced legislation to keep the rule from being implemented, and the NSSF and NRA sued unsuccessfully to block it. The intertwined fears of crime and gun confiscation were on display months later in the wake of the theater massacre in Aurora, Colorado. The Denver Post reported a spike in gun sales as people prepared either for their own encounter with a redheaded lunatic or a government crackdown on guns. Gun manufacturers and the gun lobby haven’t always seen eye to eye. When Smith & Wesson struck a deal with the Clinton administration in 2000, agreeing to a long list of changes to its products and business practices—including limiting the size of magazines for its semi-automatic weapons and avoiding dealers who sold a disproportionate number of guns later used in crimes—the gun lobby howled. It led a boycott of Smith & Wesson that nearly killed the company; in a span of just two years, the number of guns manufactured by Smith & Wesson fell by 44 percent. “They just beat the crap out of Smith & Wesson for a while, then let them back in,” says Diaz. Colt Firearms and Sturm, Ruger have been similarly punished for crimes against the Second Amendment. There remain differences of tone and substance between the industry, represented by the NSSF, and the political gun rights movement, anchored by the NRA. For example, according to Keane, the NSSF isn’t nearly as concerned as the NRA about a potential United Nations Treaty on Small Arms, which would regulate international transfers of guns (although negotiations over the still-vague treaty broke down in July). And after the mass shooting in Tucson, the NSSF engaged in a White House–sponsored dialogue among gun control groups and gun rights supporters about ways to reduce violence; the NRA did not. These occasionally divergent approaches reflect what have traditionally been different goals: gunmakers want to sell guns, and the gun lobby wants to fight (and re-fight) an ideological battle. But Feldman believes that “the industry feels more beholden to the NRA today than they ever did,” because of the Protection of Lawful Commerce in Arms Act of 2005—the law that essentially blocks federal lawsuits brought by municipalities wishing to hold gun manufacturers accountable for the bloodshed their products helped create. The shield legislation saved the industry, ending what Keane characterizes as “a concerted effort, guided by the [Clinton] White House, to bankrupt and destroy the firearms industry through frivolous lawsuits.” While at least one such lawsuit—by the city of Gary, Indiana—is still working its way through the courts, thirty-four states have, like the feds, barred public interest suits against gunmakers. It’s not surprising that companies support a lobbying group that encourages the purchase of their products. But the extent of corporate support for the NRA casts the group’s “grassroots” self-image—reflected in its “grassroots alerts” and “grassroots division”—in a doubtful light. The NRA’s annual meeting, where there’s always a “grassroots workshop,” is typically funded by a Who’s Who of gun industry stalwarts like Smith & Wesson, Sig Sauer, CZ-USA and Sturm, Ruger, who can pick up a “Gold Sponsorship” for $50,000 or attach their name to something cheaper, like sponsoring the annual Prayer Breakfast. So while the NRA pulled in more than $100 million in membership dues in 2010, other donations (including those from corporate supporters) totaled nearly $59 million—and advertising in the association’s publications and on its websites brought in another $21 million. The purity of the organization’s ideological goal—a commitment to individual freedom—is also a little tainted by the sheer amount of selling the NRA does. Members are bombarded with commercial solicitations for auto and home insurance, as well as insurance in case they’re killed in a hunting mishap, ArmsCare coverage for the loss or theft of a gun, and self-defense insurance to cover legal fees if they shoot somebody. The NRA also officially licenses some firearms accessories, like the protective SoundGear by LaPierre. Royalties earned the association $11 million in 2010. The link between the marketing and legislative work is anything but subtle. In March, NRA members received an e-mail encouraging them to support a proposed federal law that would force states to recognize concealed-carry permits issued by other states. When the law passes, the NRA e-mail exclaimed, “you’ll enjoy increased freedom—and that means you’ll need some new NRA equipment!” Like, say, a new holster. Or a sweatshirt—a hoodie—specially made to conceal a gun. As the NRA notched victory after victory over the past decade, the gun-control movement reoriented—by all but dropping the idea of gun control. Its focus shifted from seeking gun registration or banning certain guns to trying to keep specific categories of people—felons, domestic abusers, the mentally incompetent—from getting weapons. This shift was spearheaded by New York City Mayor Michael Bloomberg’s Mayors Against Illegal Guns, which, in a series of undercover operations, exposed gun dealers knowingly selling to straw buyers as well as sketchy sales at gun shows. Emboldened rather than embarrassed, the gun lobby mocked Bloomberg and trotted out a brand-new argument: stopping straw buyer sales and closing gun show loopholes would make little difference, it said, since most guns used to commit crimes are stolen—in fact, some 500,000 guns are lost or stolen every year. Yet the NRA and the gun industry have not supported rules requiring gun owners to report when their weapons go missing—let alone laws that might limit the sheer volume of guns out there to be lost or stolen. For example, a bill to limit gun sales to one per customer per month died in Massachusetts this summer. 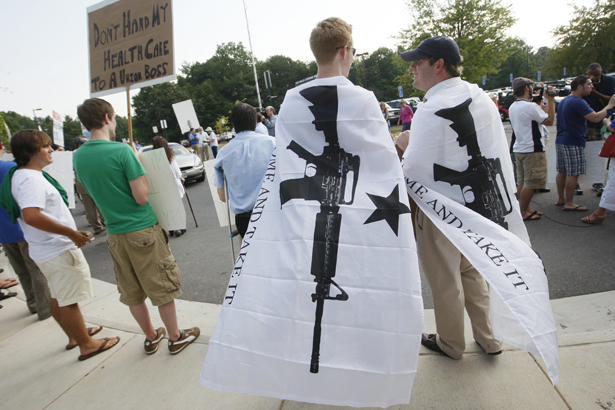 That was just one in a series of recent wins for the gun lobby. In some cases, it fought off or rolled back gun restrictions, as in the eleven pro-gun measures in the House version of the federal budget, or the defeat in New York of a bid to require microstamping—placing small identification marks on every gun’s firing pin so that shell casings found at a crime scene can be matched to a particular gun. Other measures aimed to expand gun rights anew: Oklahoma became the twenty-fifth state to allow people to carry guns openly; Virginia overturned its one-gun-a-month rule; and, as USA Today reported in March, “Legislatures in a dozen states are considering laws that would eliminate requirements that residents obtain permits to carry concealed weapons.” Still others embodied the fear of weapons confiscation: North Carolina passed a law making it clear that guns couldn’t be seized during a state of emergency, and Louisiana legislators OK’d a constitutional amendment protecting the right to keep and bear arms. Come November, should the gun-friendly Mitt Romney win and the House remain under Republican control, both the NRA and the gun industry will need a new premise for their profitable scare tactics. But as is true for the increasing number of concealed-carry permit holders packing heat each time they go out for a gallon of milk, if all you need to feel frightened is the mere possibility of danger, then danger will be everywhere. After all, New York Governor Andrew Cuomo might run for president in 2016, and he has a record as a gun control proponent. He could replace Barack Obama as Public Enemy No. 1 in NRA Country.